If you have ever looked at a lingerie model in a magazine and wondered why you don’t look like that, Megan Jayne Crabbe has got a powerful message for you. 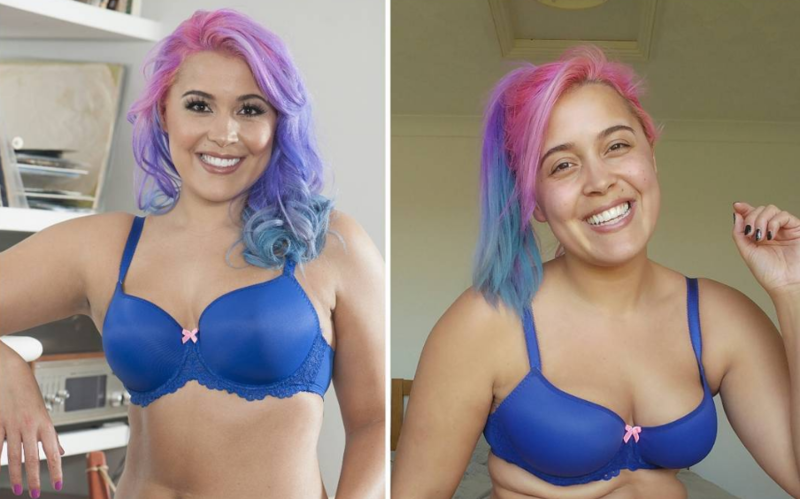 The body-positive Instagrammer, who uses the name bodyposipanda, took side-by-side photo comparisons to a whole new level by showing the difference between posed photographs and reality, and also touched on how this can affect our mental health. "I was told where to put my legs, how to angle my arm, which way to tilt my hips and even how to hold my fingers. My eyes were watering from the false lashes and my hair will probably never look like that again." On the right, she recreated the shot at home for a behind-the-scenes look at the reality behind lingerie photo shoots. While she looks completely stunning in both, the disparity is impactful since the media often only shows staged photos like the one on the left. This posed shot versus unposed shot is actually part of a series that is featured on the blog Curvy Kate. And it is worth checking out in all of its glory. In its blog post about the photoshoot, Curvy Kate said how it was inspired to do this photoshoot based on Crabbe’s side-by-side comparison in July 2016 for its #TheNewSexy campaign. "Every day we measure our bodies against the images we see, and when it comes to pictures of models (especially lingerie models! ), all we ever see are posed, polished, professional shots. The angles are always the most flattering, the hair and makeup is always supernaturally perfect, the lighting and camera quality are nothing like real life. And yet we still compare our behind-the-scenes to their highlight reel. We forget how staged the images often are and how much effort, time, and manipulation goes into each frame." While posed and professional photos have their place and time, we love that Crabbe is willing to show us what’s behind the curtain. Because comparing yourself to only staged photos is not healthy for your body image or self-esteem. In its Instagram post, Curvy Kate called Crabbe its #WCE (woman crush everyday) and we couldn’t agree more since she is always such a fabulous influence with her body-positive actions and words (as her latest project more than proves).